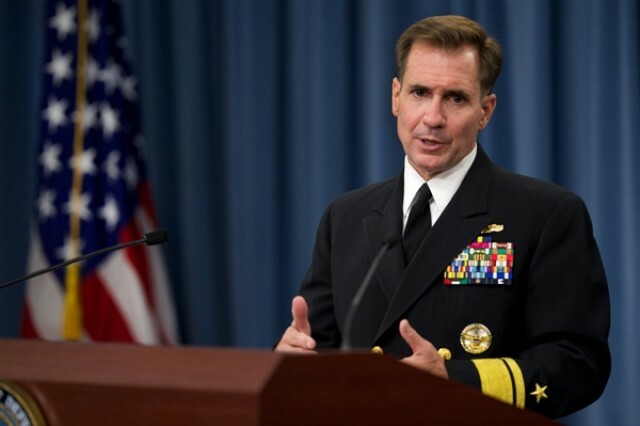 WASHINGTON (Aug. 5, 2014) -- An American general was killed Tuesday in Kabul, Afghanistan, when an individual believed to be a member of the Afghan security forces fired into a group of coalition troops, Pentagon Press Secretary Navy Rear Adm. John Kirby told reporters. The coalition troops were on a routine site visit to the Marshal Fahim National Defense University, the Afghan army's commissioned and non-commissioned officer academy, Kirby said during a news briefing today. "There are a number of casualties as a result of the shooting, perhaps up to 15, to include some Americans," he said. "Many were seriously wounded. Others received only minor injuries. The assailant was killed." Defense Secretary Chuck Hagel extends his heartfelt condolences to the family of the fallen general on behalf of the men and women of the department, Kirby said. The family notification process is not yet complete, the admiral said, and no further information will be released until that process finishes. "I'm sure you can understand that we want to respect the notification process and the family's privacy at this time," he said. Hagel received an update on the incident this morning from Marine Corps Gen. Joseph F. Dunford Jr., the International Security Assistance Force commander, Kirby said. "And he pledged to General Dunford whatever support he and this department could provide with respect to the investigation," he added. "The incident will be jointly investigated by Afghan and ISAF authorities," Kirby said. "That investigation is just now getting underway. We need to let it proceed before speculating about any specific circumstances."